I have been told all my life that carrying tissues in your handbag is compulsory at weddings because you are bound to cry. As a result, I don’t usually carry tissues. Don’t get me wrong, it’s not the tissues or the crying that I object to, it’s the handbag. On the train en route to attend the marriage of Mr and Mrs Perry, a homeless entrepreneur was selling pocket tissues. The sun was out, the pollen was high, my borrowed handbag was travelling independently, sulking in the seat opposite me. So I bought some tissues, pleasing the entrepreneur and placating the handbag. You know what weddings are like – cream lace and double pink lipstick, starched collars and alpine trouser creases, everybody scrubbed up and gorgeous. Kevin and Sandra’s wedding was no different. From Hong Kong, UK and London-wide, a glamorous parade of family and friends arrived, nervous and excited, at a Redbridge registry office. The bride and groom arrived separately, Kevin with his best man, Vince, and Sandra with her bridesmaid, Lisa. From the flowers, the bouquet , and the rings, to the giving the bride away, the confetti, and the photos this wedding ceremony was very traditional – even down to the mandatory stumbling over vows with phrases like solemnly declare, lawful impediment and joined in matrimony. The Registrar was unusually helpful, gently picking up the broken syllables and pasting them together for a word-by-word repeat as the law requires. Not long after the last I do, all heaven broke loose. Needing no second invitation, and in the style of true love, Kevin and Sandra broke with tradition to deliver a Kiss the Bride of epic proportions. No modest peck on the cheek or momentary brushing of lips for Mr and Mrs Perry. Oh no. A genuine snog in Three Acts to huge applause and cheers. For the first time in her long career, the Registrar burst into tears. Row upon row of handbags unzipped and unclasped into action, tissues were offered and passed around like canapés, even the occasional sleeve got a nose-scuffing. I was pleased I had bought the tissues. I have been to many weddings and civil partnerships, including my own, and they are all both ordinary and extraordinary in their own way. 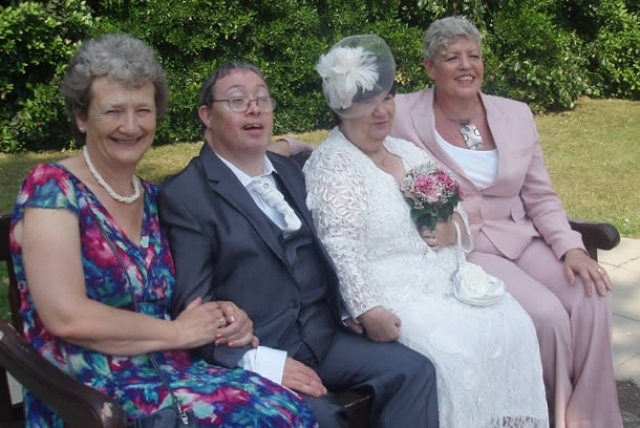 This was the first wedding or civil partnership I have been to between people with learning disabilities. Kevin and Sandra are unique and I don’t know whether I will ever be invited to a wedding quite like this again. But if I am, I will think myself very lucky to have been invited. You never know, I might even be moved to buy my own handbag.